The Shark Rocket Ultra-Light Upright HV302 keeps buyers thrilled with its sleek and versatile design. 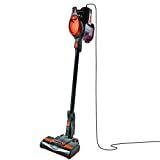 Considered the best shark vacuum currently available, the shark rocket HV302 makes stressful cleaning a thing of the past. This vacuum is a durable and easy-to-handle option, great for rugs, hard floors, and tight spaces around your house. In comparison to Dyson vacuums, this shark navigator is a revolutionary find perfect for anyone and anywhere. Although it’s not cheap, it can be used on the ceiling and upholstery to collect pesky dirt and pet hair. The shark ultra-light upright vacuum’s enhanced swivel steering and powerful suction provides both versatility and control when navigating around furniture. Featuring a 2-speed brush roll and a thirty (30) inch extension cord, the shark vacuum also offers a convenient handheld option. This is great for those frustrating sharp spaces between stairs and appliances. Including a variety of accessories, the shark rocket HV302 can be taken and stored anywhere around your house or business. The Shark Rocket Ultra-Light Upright vacuum includes a variety of handy features to help you complete your day-to-day chores. With a thirty inch extension cord and comfy rubber handgrip, this vacuum stretches the expectations on portability. Considered ten (10) inches longer than any common vacuum, its extension cord is both convenient and durable. It provides you the ability to sweep from room to room without switching sockets or slowing down. Paired with its powerful 2-speed suctions, the lengthy cord will save you quite a few minutes in your normal cleaning routine. The shock rocket HV302’s 2-speed option provides consumers the ability to choose between two powerful suctions. Although it can’t be turned off, it can be changed with a simple switch on its motor. The first speed is great for a quiet, quick dusting around the house. It can be used to pick up dirt from hard floors and beneath furniture. The second speed kicks in for those thick rugs and carpets. The quick and easy washable filter makes cleaning a breeze. After every other use, simply remove the filter, rinse it, and then return it to the vacuum. This will keep your shark vacuum powerful and clean. Unfortunately, it’s not HEPA certified, so it may not be the best option for those who suffer from asthma or allergies. With a dust capacity of 0.118 gallons, the dust cup can be easily removed, rinsed and returned after use. It provides a cheaper and cleaner alternative to dust bags which require future purchases. The shark rocket HV302 converts into a powerful, sturdy cleaning wand to reach high corners and tight spaces. Simply remove the vacuum’s base, attach one of the complimentary suction heads, and get to work. When you’re finished, just reattach the base and set the vacuum aside for future use. The shark vacuum provides a car detail kit that includes various miniature attachments. You can use them to clean the crevices of your car leaving it fresh and spotless. You can store them in the shark navigator accessory bag or the dashboard of your car. Attached to the side of the shark upright stick vacuum is a useful wall mounting hook. This allows you to store it anywhere in your house for easy access. The complimentary accessory bag provides a safe storage container for your shark navigator attachments. You can store it anywhere, such as your closet, cabinets, or garage for quick, easy access. The attachable dust away brush is a wide mouth tool with a reusable microfiber pad. It’s guaranteed to clear dirt and debris from any corner of your house, business, or car. The pet upholstery tool is perfect for collecting thick wads of pet hair from fabric and carpets. With its wide mouth and short bristles, this tool will clear your house of any fur or dander hidden in its seams. The twelve (12) inch crevice tool can slip between appliances and furniture to collect hidden dirt and dust. You can use it in the bathroom, on stairs, or even in your car. Whatever you need, it can do it. The Shark Ultra-Light Upright Vacuum has a five (5) year limited warranty. If Shark Rocket Ultra-Light Upright HV302 breaks down within the warranty period, you have the option to return it. If the vacuum is deemed defective, you can obtain either a refund or a replacement, free of charge. To receive a refund you must return the appliance and accessories with a receipt of purchase and date. Unfortunately, shipping may not be reimbursed. Non-durable parts are not covered by the warranty. This includes filters, brushes, and various electrical parts. Thankfully, you can purchase replacements separately on amazon.com. Brush doesn’t turn off: In order to shut off the vacuum you have to unplug it. This can be awkward in certain situations. The Shark Rocket Ultra-Light Upright HV302 is the perfect alternative to any stocky stick vacuum. It’s important to note that the shark vacuum is meant for rugs and upholstery, rather than a completely carpeted home. However, you can use this shark navigator in your house, car, or business, while promoting a professional, sleek appeal. If you’ve purchased a shark rocket HV302, please share your experience. Did you like it? Would you buy another? How much did you pay? Would you recommend purchasing a Shark Rocket Ultra-Light Upright HV302 to your friends?